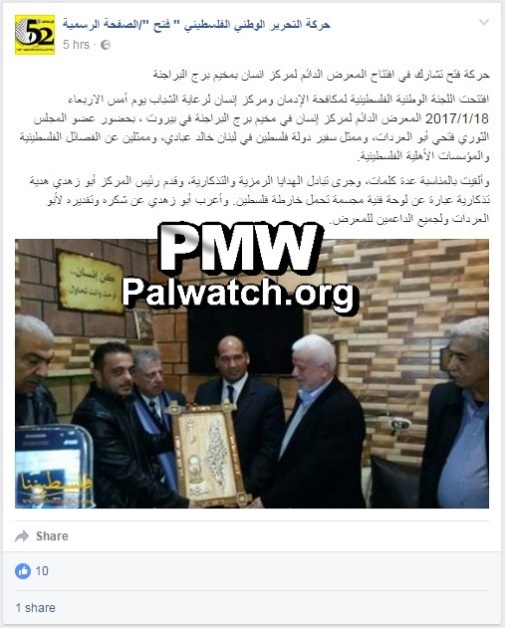 The picture shows Director of the Insan Center Abu Zuhdi at the Burj Al-Barajneh refugee camp in Beirut, Lebanon, giving Fatah officials a plaque of honor on which is the PA map of “Palestine" that presents all of Israel as "Palestine" together with the PA areas. Posted text: "The Fatah Movement participated in the opening of the permanent exhibit at the Insan Center at the Burj Al-Barajneh refugee camp. Director of the [Insan] Center Abu Zuhdi gave a souvenir in the form of a three-dimensional artistic plaque bearing the map of Palestine (the PA map of “Palestine" that presents all of Israel as "Palestine" together with the PA areas –Ed.)"